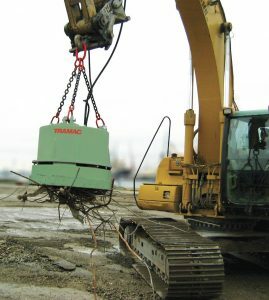 The self-contained hydraulic magnet for cleaning and separating iron and steel from waste concrete and debris is ideal for demolition and recycling! This handy magnet is controlled directly by the hydraulics of the carrier, and combines an electric magnet coil and hydraulic generator with automatic control system. Fast and easy mounting using a chain or quick coupling plate directly to the boom, with hydraulic quick couplings. The required oil flow is very low, so all basic functions work at the same time. Oil flow and pressure-limiter valves allow installation on every machine. Easy to use! The magnet is controlled by the breaker button or pilot pedal. Turning hydraulic oil flow on activates the magnet for lifting iron and steel. Turning the hydraulic oil flow off makes the magnet demagnetize automatically.